While the team promoting the Medical Innovation Bill have continued to claim that it protects patients — indeed that it strengthens patient protections — they have been quietly chipping away at those protections. Even if the Saatchi team’s claims about innovation were true, the Bill cannot succeed in its aims. 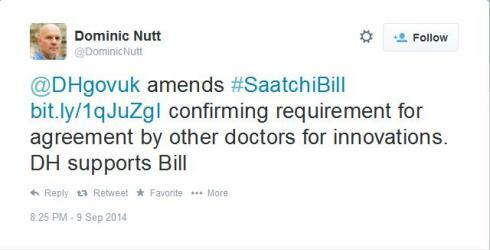 Many bold claims have been made for Lord Saatchi’s Medical Innovation Bill, the so-called Saatchi Bill. Apart from the assertions from its promoters that it will find a cure for cancer, one of the chief claims made for it is that it will solve what they identify as the main barrier to innovation — that doctors don’t try new treatments because they fear being sued for negligence. The Bill will, they say, allow doctors to try experimental treatments, safe in the knowledge that they cannot be sued for it. There have also been claims from the Saatchi camp that concerns raised by medical, legal and patient groups that the Bill is dangerous are unfounded, and that the Bill would provide effective protection for patients when a doctor tries an experimental treatment. This article will show that the Bill cannot achieve its aim of reassuring doctors that they won’t be sued for innovating, and it cannot adequately protect patients either. It will show that the Saatchi Bill team have given incorrect assurances — in the press, on social media, on their website and in the House of Lords — that it preserves patient protection by requiring a doctor to get agreement from colleagues before treating, when even its own legal adviser acknowledges this is not the case. What the Saatchi Bill attempts to do is to “bring forward the Bolam test.” The aim is that, instead of waiting to be sued, the doctor could undergo the same test they would have undergone in court. If they pass the test, it is claimed that they are able to go ahead with the treatment safe in the knowledge they can’t be sued. The proponents of the Bill have been explicit here: they intend that if a doctor goes through the Saatchi process correctly with a proposed treatment, they cannot be sued for negligence for providing that treatment. But, as the Bill’s own accompanying notes make clear, they are not actually required to accept these views. There may be “reasonable grounds” to ignore the views of others. Who decides whether the grounds are reasonable? The doctor giving the treatment. So instead of a requirement for a responsible body of opinion to have supported the doctor’s view, the doctor can now decide alone for him or herself and be protected by the Bill. Firstly, the scope of what constitutes responsible treatment is hugely extended. Treatment decisions that other doctors would support are still protected, as they were under Bolam, but added to what is considered responsible are decisions that have no support at all from other doctors as well as those which have support but lack logical basis. This is where opponents have seen scope for quackery to enter. Put simply, you can’t have it both ways. Either the doctor’s decisions are open to challenge or they are not. Eminent legal opinion on the subject has stated what is likely to happen: there will be many challenges to Saatchi Bill treatment decisions. There is so much vagueness in the wording and definitions within the Bill, that these challenges are inevitable. This kills any possibility of giving doctors reassurance they won’t be sued. So far so futile. But the Bill isn’t simply ineffective in its attempt to modify the law — and harmless as a result — because it fundamentally changes the legal landscape, to the detriment of the patient. This is because the Bill effectively replaces Bolam and Bolitho — tests of whether the treatment was carried out responsibly — with a completely different test, a test of whether procedures were followed when deciding to treat. The result of the Bill is to put the treatment itself effectively beyond challenge, an emasculation of Bolam and an abandonment of Bolitho. To repeat, it is the intent of the Bill that if a doctor follows its procedures correctly when deciding on a course of treatment, they cannot be sued for undertaking that treatment. This is where quackery can thrive. As José Miola has pointed out, the Bill provides no mechanism to allow a court to review the treatment decision, and if the Bill were to successfully bring forward the Bolam test to protect a doctor from later being sued, it closes off the ability for anyone to check later whether the treatment was responsible. So why not solve this problem? Why not put it beyond doubt by making it explicit that agreement is required rather than just consultation? This is exactly what Lord Turnberg asked for with a proposed amendment (Amendment 7) at the Committee stage. Apart from the inconvenient point (for the Bill team) that making such an amendment would turn the Bill into a restatement of the current definition of responsible treatment, so demonstrating that it is unnecessary, there is no reason not to make this change. It is, after all, what the Bill team claim the Bill actually means. I believe that it is similar to my amendments in the sense that they both replace the existing conditions for the operation of the defence to negligence under the Bill with an alternative set of conditions. I understand that the noble Lord is trying to find a set of conditions that limit the opportunity for the Bill to be misused by quacks. As I have said, my amendments, proposed by Sir Bruce Keogh and the Secretary of State following consultation, have the same purpose. Earl Howe, on behalf of the government, supported Lord Saatchi’s assertion. Were they right? No, and the explanation can be found in the latest amendments Lord Saatchi has tabled. Unlike the amendments tabled by his noble colleagues, which have almost all been rejected, these will presumably all go through, as Saatchi’s previous amendments have. Along with these amendments, there are further accompanying notes, prepared by Daniel Greenberg. There’s a revealing paragraph in those notes, as Nigel Poole has spotted. This paragraph makes two very worrying things clear. Firstly, the Saatchi team expect the consultation process to be very informal. A doctor is expected to describe their proposal to a colleague, who will give their advice without necessarily knowing the patient’s history or other circumstances. Under these conditions, it’s easily possible to see the doctor asking about the general treatment methodology without referring to any individual patient at all, and using the advice received as justification for treating many patients. This cannot be seen as any replacement for Bolam/Bolitho, which formally examines an individual case in detail. Secondly, the notes say — in bold text no less — that the Saatchi Bill team have deliberately avoided the requirement to obtain formal consent from colleagues. Essentially, Daniel Greenberg admits that “senior doctors” and “lawyers” didn’t want this sort of full agreement to be a requirement, and thus it was not included. At a bare minimum, it shows that the Bill team has been aware for some time that the Bill would not and could not require a full, formal agreement based on all of the information about that individual patient. If the Bill were to require the explicit agreement of another doctor to innovate—that is one suggestion made in the other place—we are worried that that would open the possibility of a new negligence action against the countersigning doctor and lead to more confusion. We would not be able to give the countersigning doctor any certainty about their legal position, and they would not be able to rely on provisions in the Bill. Remember when Lord Saatchi told Lord Turnberg that the Bill gave effect to his wish to require consent? All these claims cannot be supported, given what we now know about the Bill’s actual stance on consent. On the contrary, the Bill deliberately avoids requiring full agreement on the part of the consultee because whoever helped them draft that section pointed out — quite rightly — that obtaining this type of consent would probably make the person consulted legally liable along with the doctor for anything that went wrong, particularly since the Bill envisages the consultee relying solely on what the doctor has told them. The Saatchi Bill wants to make consultation watered down and informal, so requiring full consent is impossible. The irony that if the Saatchi Bill genuinely worked as they publicly claim it does, doctors would fear being sued for following it will not be lost on the reader. Daniel Greenberg has ruled out having signed agreement, because of concerns that the signing colleague wouldn’t know the full facts. 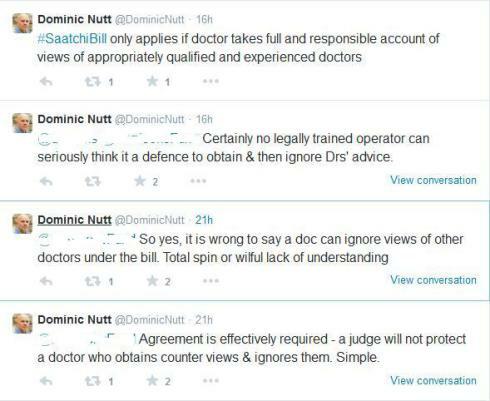 There is thus no requirement for formal and fully informed agreement, or even for a consensus to be reached, regardless of what Dominic Nutt may claim. All that the Bill requires is that the consultee gives a view, without necessarily knowing the full facts of the case, and that the innovating doctor takes that view “into account” when reaching their decision. We don’t know how long ago the Bill team had the discussions that led to their decision not to require full agreement, so we don’t know whether the claims they have previously made were entirely correct when they made them. But they are clearly not correct now, and yet the Bill team continue to imply that full, formal agreement is required in the Bill when Daniel Greenberg’s notes explicitly state that it is not. They ought to issue a correction, because they are acting as if they are still where they started, where consultation apparently meant a panel of doctors or a multi-disciplinary team, not an informal chat in general terms with a “relaxed” colleague. This claim is made despite the fact that each successive revision of the Bill has watered down the consultation process, and that it now allows a doctor to bypass Bolam and Bolitho, replacing them instead with an informal chat with a colleague, the result of which is that the patient is denied the right to sue. How can this possibly be safer? So where does all this leave us? With a completely broken Bill. Even if you accept the claim that doctors fear to innovate (they don’t), that deviation from standard treatment is negligence under current law (it isn’t), if you believe that the way to deal with doctor’s fear of the law is more law rather than training (it isn’t), then the Bill still fails in its primary aim of protecting doctors from litigation, and it won’t even cure cancer. There will be more litigation, it’s just that in future the litigation will be over Saatchi Bill treatment decisions. At the same time as generating more litigation, the Bill will damage vital patient protections. It replaces coherent, well-settled negligence rules with an informal consultation process that badly damages Bolam and quite likely does away with Bolitho. And the Bill team, even if they didn’t know it before, surely know it now.